The Shaolin temple (Chinese: 少林寺; Hanyu Pinyin: Shàolínsì; literally «Young Forest Temple») is a Chinese Buddhist monastery famed for its long association with Chán (Japanese: Zen) Buddhism and martial arts, and is perhaps the Buddhist monastery best known in the West. According to the Continued Biographies of Eminent Monks (645) by Daoxuan, the original Shaolin monastery was built on the north side of the Shaoshi peak of Mount Song, one of the Sacred Mountains of China, by Emperor Xiaowen of the Northern Wei Dynasty for the monk Batuo, who for thirty years preached Nikaya Buddhism in China.Yang Xuanzhi, in the Record of the Buddhist Monasteries of Luoyang (547), and Li Xian, in the Ming Yitongzhi (明一統志; 1461), concur with Daxuan’s location and attribution.The Jiaqing Chongxiu Yitongzhi (嘉慶重修一統志; 1843) specifies that this monastery, located in the province of Henan, was built in the 20th year of the Tàihé (太和) era of the Northern Wei Dynasty (i.e. 497 AD).The monastery has since been destroyed and rebuilt several times, remaining one of China’s oldest Buddhist temples. Perhaps the most famous name associated with Shaolin is that of Bodhidharma or, in Mandarin, Damo. He is said to have been either a Persian or South Indian monk who travelled to China in the 5th or 6th century to teach Buddhism. Bodhidharma’s ministry at Shaolin formed the basis for what would later be called the Zen or, in China, Chán (both terms derive from the Sanskrit term Dhyana, which means meditation) school of Buddhism. After entering Shaolin, legend states that Bodhidharma found the monks out of shape from lives spent meditating and they often fell asleep during mediation. The story relates that Bodhidharma meditated facing a wall in a nearby cave for nine years, after which he introduced a regimen of exercises sometimes thought to have been the 18 hands of lohan or the damo muscle changing classic. Eventually these movements gave rise to martial arts. Traditionally, the Shaolin monks developed their martial arts expertise as a defense against aggressors’ attacks, as a means to promote health, and as a mental and physical discipline. The codification of martial arts by monks most likely began with military personnel who retired to monasteries or sought sanctuary there. The monastery was a refuge where, unlike the battlefield, such individuals could exchange expertise and perfect their techniques. The temple’s military fame began during the early Tang Dynasty (618–907).The Shaolin Monastery Stele of 728 describes Shaolin fighting monks assisting then-future emperor Li Shimin in his fight against rival Wang Shichong.Once enthroned, the gratified emperor enlarged their compound and gave permission for some monks to continue their military training. 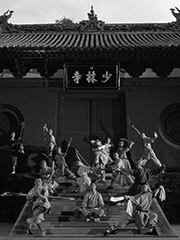 Shaolin kung fu reached its peak during the Ming Dynasty (1368–1644), when several hundred Shaolin monks were given military status and personally led campaigns against rebels and Japanese bandits. By this time, the Shaolin monks had developed their own unique style of martial arts. The original temple survived being sacked and rebuilt many times.In 1928, the warlord Shi Yousan set fire to the monastery, destroying many priceless manuscripts of the temple library, some of its halls, and damaging the aforementioned Stele.The Cultural Revolution purged all monks and Buddhist materials from within its walls, leaving the temple barren for years. It was subsequently rebuilt, repopulated and designated an official tourist site by the Chinese government after the overwhelming success of the Jet Li movie Shaolin Temple in 1982. Martial arts groups from all over the world have made donations for the upkeep of the temple and grounds, and are subsequently honored with carved stones near the entrance of the temple. By far the best-known destruction of the Shaolin—by the Qing Dynasty’s Manchurian army—may have been merely apocryphal.In fact, Kangxi, the second Qing emperor, was such a supporter of the Shaolin temple in Henan that he wrote the calligraphic inscription that, to this day, hangs over the main temple gate. Accounts of the Qing Dynasty destroying the Shaolin temple may refer to a southern Shaolin temple, which Xu Ke, in the Qing bai lei chao (1917), locates in Fujian Province.Some accounts even state that there was more than one Shaolin temple in the area. A Dharma gathering was held between August 19 and 20, 1999, in the Shaolin Monastery, Songshan, China, for Buddhist Master Shi Yong Xin to take office as abbot. He is the thirteenth successor after Buddhist abbot Xue Ting Fu Yu.